It’s day 300 today, can you believe it! It really feels like a bit of a milestone! As the nights are dark early now I’m going to try and make sure that I get out every lunchtime to search for a dog which I did today. I’d been walking for a while when I spotted a lovely smiley dog across the road so I went over to say hello. 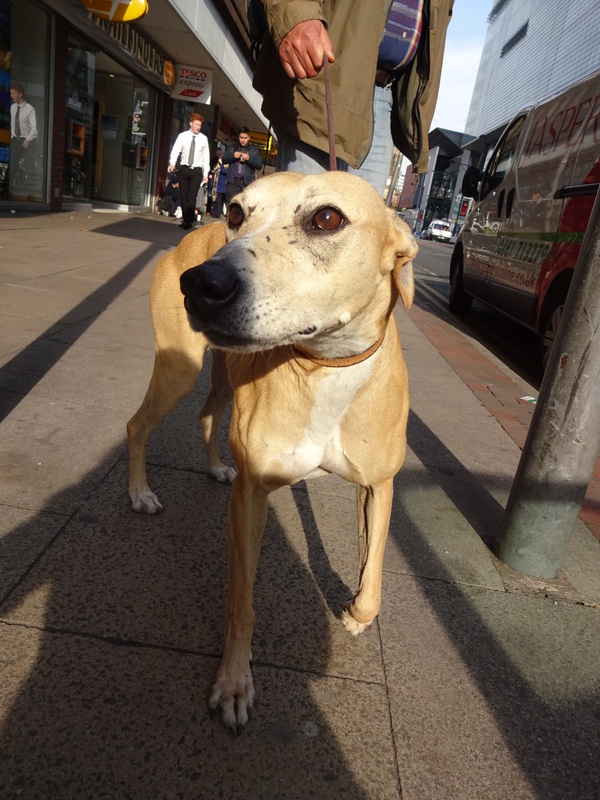 Millie is a Lurcher, she’s a lovely girl, so friendly with such a kind face! Millie is a rescue dog from Manchester and Cheshire Dogs home and she’s lived with her current human for 4 years. She was in a bad way when her human first got her but she’s a happy girl now! Millie lives on a barge with her human. Age: 11 years old (human years). Millie’s human isn’t 100% sure of her age due to her being a rescue dog. Favourite pastime: Running after rabbits!